By the time the first 24 minutes of play concluded, the Cardinals held a commanding 27-point lead and were soaring toward something they hadn’t reached since 2007 — the state title. Putting a huge exclamation point on an undefeated season, Greenwich rolled from start to finish in registering a resounding 34-0 win over New Canaan in the championship CIAC Class LL Tournament before a big crowd a Boyle Stadium. This family coaching matchup, featuring son John Marinelli of Greenwich and father Lou Marinelli of New Canaan, saw the Cardinals seize a 27-0 halftime advantage en route to sealing their unbeaten season with their 13th victory. Barber, the son of former New York Giants star running back Tiki Barber, had nine receptions for 153 yards and three touchdowns and also threw a 27-yard touchdown pass to sophomore running back Hunter Clark off a trick double-pass play. Muir passed for 262 yards and three touchdowns and ran for another score for Greenwich, which ended its memorable season with its sixth shutout. Junior quarterback Drew Pyne passed for 163 yards for the eighth-seeded Rams (10-3). After catching an 8-yard pass from Muir, putting the ball on the 2-yard line, Barber hauled in a Muir pass in the end zone the ensuing play, giving Greenwich a 7-0 lead with 2:27 remaining in the first quarter. The Cardinals extended their edge on their ensuing drive, with Muir connecting with the elusive Barber down field for a 60-yard touchdown at the 10:43 mark of the second quarter. Following a New Canaan three-and-out, Barber accounted for another touchdown, this time with his hands and arm. Muir threw a lateral to Barber, who snared the pass with one hand. He then set himself and delivered a 27-yard touchdown pass to a wide open Clark, making it 19-0 with 7:35 to go in the second quarter. A New Canaan drive sparked by several receptions from senior Quintin O’Connell, was halted at the Cardinals’ 32-yard line by Ryan Raybuck’s interception in the second quarter. Following the turnover, Greenwich scored its final touchdown of the opening half, an 8-yard run up the middle from Muir with 17 seconds left. Barber capped his 153-yard receiving day with a 10-yard catch in the end zone in the fourth quarter. Anchored by senior center Jack McBreairty, Greenwich’s offensive line performed well against New Canaan’s formidable front. As usual, defensive linemen Mozi Bici, Eddy Iuteri, Emilio Camou, Joe Kraninger, along with linebackers Jack Feda and Larry DeLuca, pressured the quarterback throughout. Large had nine receptions for 94 yards, senior Tysen Comizio had 144 yards rushing for the victors. 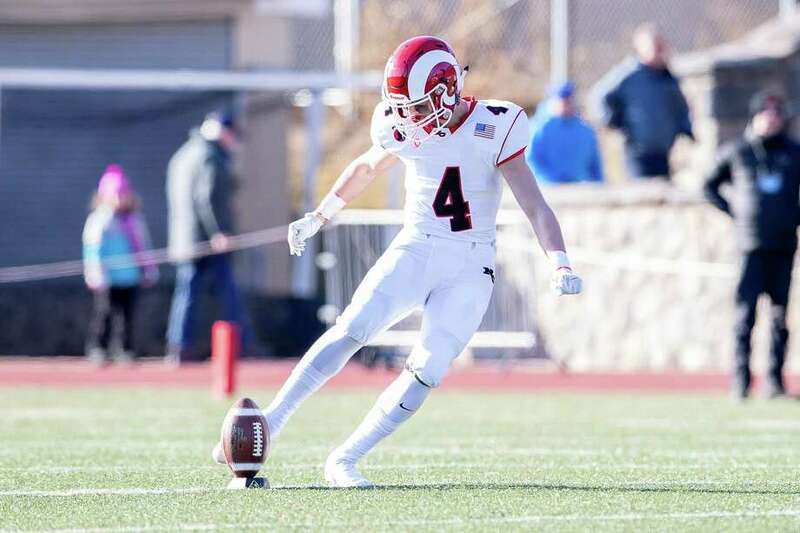 ... O’Connell had seven receptions for 41 yards for the Rams and teammate Wyatt Wilson had five catches for 52 yards. “Our passing game and running game were clicking, you can’t ask for anything more from our offensive line,” Comizio said.